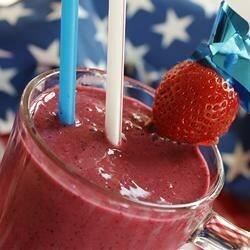 "This delicious smoothie is sweetened with natural sugars. Replace any of the fruit ingredients with your favorites if you like, but make sure one of them is frozen to make it nice and thick!" Place the banana pieces, strawberries, blueberries, milk, vanilla extract, yogurt, and ice cubes in a blender. Blend until smooth. Did not have a lot of flavor. Was not what I was expecting it to be. Delicious! Very healthy and easy for a quick breakfast! I used fat free yogurt and skim milk to cut down on calories and fat but you'd never know from the taste. Nice smoothie! I didn't have any banana so I added more strawberries instead. I also added 1 Tbsp of flax seed. Since I didn't have anything frozen in there it could have used a bit more ice. This was great! It mixed perfectly in the tall cup of my magic bullet. Thanks for the post! My 3yo loved it!